Wind was strong this past kite club fly day and the sun was out. Woohoo! However, it was chilly and the last day that the grandkids were down for a visit. So there was no kite flying for us this weekend. There was kiting activity of another sort in our house recently. I have added two new Revolution kites to the kite bag. The first is a kite I saw in a photograph from the KTAI (Kite Trade Association International) convention. Only a small segment of it was visible but it was enough for me to want to see the whole thing and maybe see if I could get one like it. As it turns out, our local kite shop owners came home with it and I got to see it close up. Than only made me want one even more. A quick phone call was all it took. I am now the proud owner of the red geisha Revolution. The kite skin was designed and printed by Los Hermanos Gonzalez in Spain. Then it went to Revolution Kites in California to be bridled and framed. And finally to me in NC. The second Revolution kite is really a piece of history. 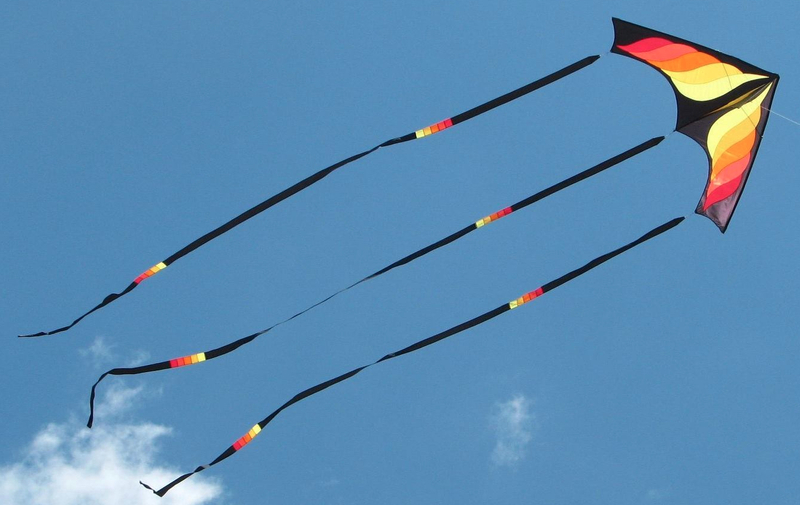 The first Revolution kites were called the Neos Omega. It was only after a law suit regarding the use of the name that Revolution Kites became as we know it today. There weren’t too many kites made before the name change. One of those originals is now mine. Because of the size of a reinforcement in the center “V” of the kite, it has been identified as one of the first 80 kites made. The first 20 kites had no reinforcement at all so that makes this kite one of only 60. And it comes to me new and un-flown. I have been asked of I will fly the Neos Omega. The answer is yes but only for special exhibition purposes. I have plenty of others to fly day-to-day. Congrats on two scores!!! I love having unique kites, no special Revs yet…. Have. Rev 1, that’s about it. Love to fly it! !